The Starbucks card mobile application is the latest in iPhone apps and allows customers to pay right from their mobile phones, getting them that much closer to that instant java fix. 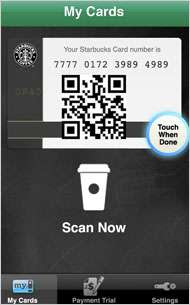 The application works like any other Starbucks card and gets charged to your credit card. Starbucks has another application in the works, myStarbucks, that gives users recipes to their favorite coffees and drinks and also helps choose your next Starbucks latte when you are feeling a bit indecisive. I read some of your posts and I enjoyed reading them. Thank you for sharing. I'll keep on visiting your blog and hope to read more topics and informations!